Holiday window displays are a beautiful way to decorate for the season. But they’re more that that – holiday window displays are an effective marketing exercise, creating an opportunity to show off your products and brand in a unique way. Since 30 percent of retailers’ annual sales occur during November and December, and holiday window displays influence 24 percent of the holiday purchases customers make, it serves you well to have great holiday window displays. So when should you decorate your shop’s windows for the holidays? You should get started early, since fifty-four percent of consumers actually start researching holiday purchases before Halloween. This means holiday window decor should be up and ready around Thanksgiving. But even if it’s after Thanksgiving, don’t worry – you can still decorate to impact holiday sales for the better. Here are 13 ideas for creating retail holiday window displays that really pop. Find your purpose: Determine if your main objective is to show off your product or illustrate your store’s brand. Toy stores are often stocked with fun product, while retail stores such as Anthropologie often focus on brand with whimsical holiday window displays. Avoid clutter: Clean, carefully curated holiday window displays have a stronger visual impact than displays stuffed to the gills with products. This is especially true with more expensive items. When pricy items are crammed together, they look less enticing. Pique curiosity: Many successful retail holiday window displays allow people to see through into the store. Choose a star product: If you’re working on a product-based display, pick one item as the focal point. This might be a higher-price item that’s visually striking. Be sure to put ample space around it for greater impact. Create a scene: Some holiday window ideas to get the creative juices flowing include a snowy meadow with animals, a cozy living room on Christmas Eve, a ski slope, etc. Repurpose familiar objects: Cotton balls or marshmallows hanging from fishing line can become snow. Or dangle painted lightbulbs fashioned to look like Christmas tree decorations. Commonplace objects repurposed in unusual ways make for striking and inexpensive holiday window displays. Make a tree: Arrange merchandise in a triangular tower like a Christmas tree. For retail holiday window displays, think shoes stacked on wooden blocks for shoe stores, or a pyramid of books for bookstores. Surprise and delight: Many stores create visually beautiful holiday window displays, but a dose of humor can also be effective. Create height: Successful holiday window ideas put products at eye level where people can easily see them. Use the window’s vertical space for better visibility to create a more dynamic display. Display products on wooden crates arranged into shelves, stacked tables, or on a ladder (which incidentally also makes a great Christmas tree shape). Or hang objects from the ceiling. 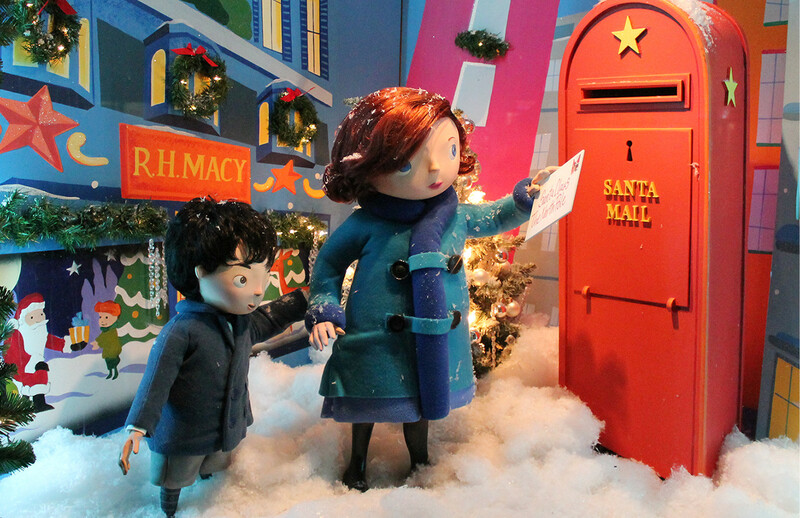 Get crafty: Many of the most innovative holiday window displays have a homemade, crafted look. Think snowflakes cut from newspaper or coffee filters, or even pinecone snowflakes, instead of mass-produced decorations. Light it up: In addition to Christmas tree lights, use spotlights to illuminate and design lighting so your display pops both day and night. Start a movement: Use a fan to give your retail holiday window display a more dynamic, kinetic element. Walk by: Go outside and walk by your store window. What catches your eye? Is it easy to see everything? Next, drive by and note what you can see and what’s lost. Then adjust your display accordingly. Now that you have some good holiday window ideas, you’ve got everything you need to start planning a unique display that helps bring customers into your store. Image credit: “38.Macys.MetroCenter.WDC” by Elvert Barnes, Flickr, CC by SA 2.0, cropped from original.